To learn more or to change or differentiate your consent to cookies see here: cookies policy link. These two flutes do not produce sounds at intervals but rather in the manner of the human voice. This sound is produced by moving your hand up and down, as on a trumpet or a flute. You can also produce sounds at tone intervals of 1/8 and 1/16, and any other sound you like. This flute has a straight uninterrupted slit instead of the classic holes. 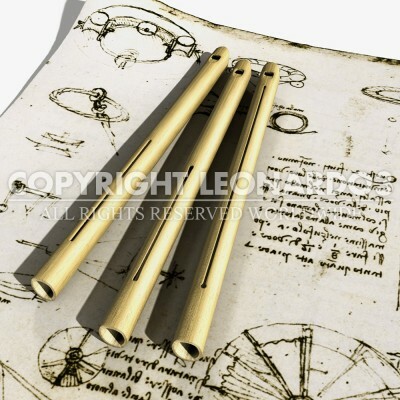 Following Leonardo’s indications, the flautist can cover the slit with his hands and, by moving them, modulate the note’s intonation at will. He can thus produce all the sounds between the hypothetical positions of the holes on a traditional flute. The design is functional, as the instruments displayed here demonstrate, and the sound is similar to that of a modern toy slide whistle. The textual description is simplified. 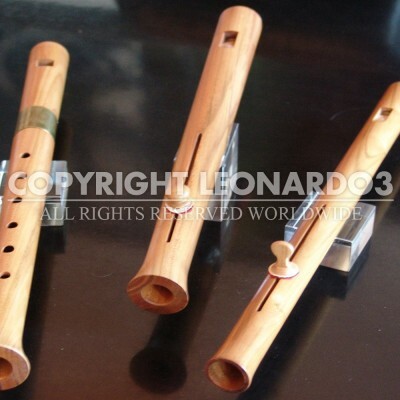 Leonardo failed to explain that to make these flutes you need to create an internal chamber in addition to the slit; otherwise, the sounds described in the text would be impossible to produce.